A shift in Pentagon strategy will add one more nuclear submarine to Pearl Harbor's fleet of 17 by 2008. 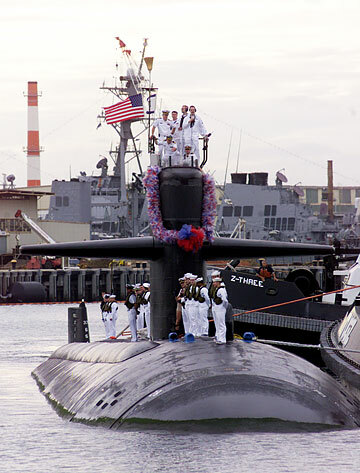 Here, the USS Key West nuclear sub is shown returning to Pearl Harbor after a six-month deployment. As part of a shift in Pentagon strategy, there will be more nuclear submarines working in Pacific waters by 2008, with Pearl Harbor's fleet growing to 18 from 17. The Navy's sub force of 52 is split almost evenly, with 28 boats prowling the waters of the Atlantic and 25 in the Pacific. By 2010 there will be 31 nuclear-powered attack subs in the Pacific Fleet and 21 assigned to the Atlantic Fleet, a Navy official said. The change is part of the Pentagon's Quadrennial Defense Review, which called this month for a shift in the Navy's submarine force, where 60 percent of its fleet would be located in the Pacific by 2010. This month's Pentagon report says China's investment in submarines, advanced torpedoes and cruise missiles increases security risks in the region. A Navy official said yesterday that the USS Jacksonville -- with a crew of 133 -- is supposed to report to Pearl Harbor in 2008, leaving its home port in Norfolk, Va. There are 17 subs home-ported at Pearl Harbor and three in Guam. Next year, two attack subs -- the USS Seawolf and USS Connecticut -- will move from the Atlantic Fleet to the Pacific Fleet and be based at Kitsap Naval Base in Bremerton, Wash., according to Rep. Norm Dicks, D-Wash.
"The Navy is appropriately shifting its fleet to address the more serious threats in the Pacific and it represents another indication of the growing importance of Puget Sound as a strategically critical West Coast home port," Dicks said in a news release. The two Seawolf-class submarines will join the aircraft carrier USS John Stennis, home-ported in Bremerton, and eight Trident ballistic missile submarines home-ported at nearby Bangor Submarine Base, Dicks said. Bangor is also home to two of the newly converted Trident ballistic missile submarines and the third and final Seawolf-class sub, the USS Jimmy Carter, which conducts classified missions, Dicks said. The other gain in the Pacific Fleet will be at San Diego, where its numbers will climb to seven when it gets three more attack subs. The losses in the Atlantic Fleet will come from Norfolk Naval Base in Virginia, which go to seven from 11; and New London, Conn., which will drop by three to 14. In his military budget proposed for the coming year, President Bush said he wants to deactivate four Los Angeles-class attack submarines and bring on line one of the newer Virginia-class boats. There are now three types of nuclear-powered attack submarines in the force -- the Los Angeles, Seawolf and Virginia classes -- in addition to 18 Trident ballistic missile boats. The nuclear warheads on four of these "boomers" are now being removed and replaced with conventional Tomahawk cruise missiles and will be used in SEAL special underwater warfare operations. Of the remaining 14 "boomers," nine are home-ported in Bangor, Wash., on the West Coast and five in King's Bay, Ga., and part of the Atlantic Fleet.